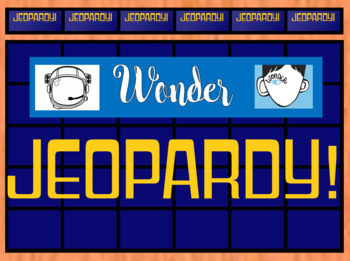 This is a fun and engaging Jeopardy-style review game for the Best-selling novel, Wonder by R.J. Palacio! 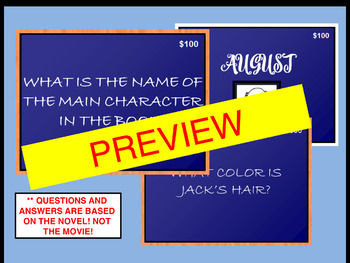 Download contains 133 slide powerpoint game with 2 rounds of game play, a final jeopardy round and "Daily Doubles!" Answers are included with each question. Detailed directions for easier game play included! No buzzers or timers needed while everyone gets a chance to play!! 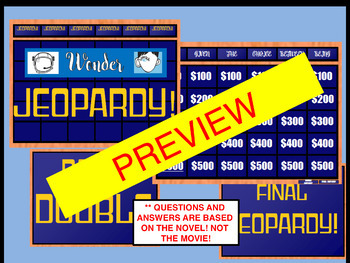 Original Jeopardy template was purchased from Lady Lion's TPT store. Permission was granted to use in this file.